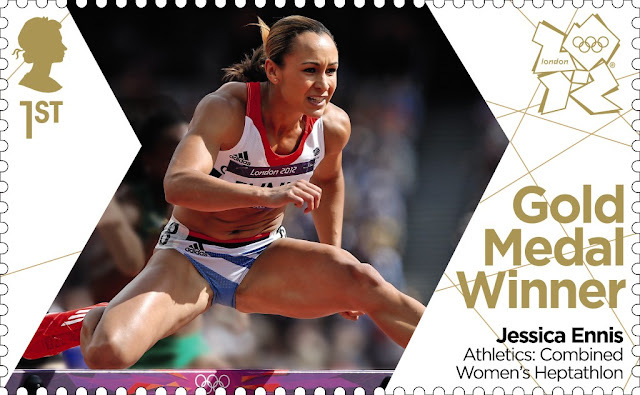 When Jessica Ennis won the Women's Heptathlon Gold Medal at the London 2012 Olympic Games, Royal Mail issued this stamp, one of 6 gold won on Super Saturday, 4 August 2012. I kept this blog updated with the images as they were placed on Royal Mail's Image Library, usually within an hour of the medal being won. According to BBC Sport's website, the Modern Heptathlon was scheduled to finish around 21.02. The image above is from that library - it is still there, I have just looked at it again. The images were made available to Royal Mail's six regional printers at about the same time, so that printing could commence as soon as possible. The stamps were printed and (as I reported at the time) available in selected post office branches by 11.30 am on Sunday morning. This stamp uses an image from the Istanbul IAAF World Athletics Series earlier in the year. If the stamp was indeed purchased at a Post Office there ought to be, as Brandon suggests, another 12 out there as they were printed in sheets of 24. And if one sheet was printed, then many others should have been. What seems more likely is that this is another trial, an example of "printers' waste" which should never have escaped from the factory. Conceivably such a sheet could have been mixed up with those printed overnight on 4/5 August, but it seems more likely that this has been hidden away for 18 months and that somebody is now trying to pass it off as having been legitimately sold at a post office. Completely agree. It's a very big ask to believe these just "turned up" in the regular stock of an unsuspecting PO and your suggestion seems much more likely. Either way the stamps are now being sold and will get entered in the catalogues making them a modern day rarity that will quickly climb in value. It should be easy for Royal Mail to confirm the veracity of the issue. Did they (RM) have the appropriate permissions to use the copyrighted image or not. If not then the veracity of the stamp is called into question. If you know your solvents, it is very easy to remove the printing from modern stamp, even the security overprint on the machins. Anyone with a basic graphics program could if they were so minded print anything they wished in the area previously containing an image. These actions would fall foul of the Fraud Act 2006 & the Proceeds of Crime Act2002, plus any civil action the copyright holder deems appropriate. This also raises the question legal ownership of the blank post & go labels.